and we'll start to have a painting. As you can see it's still wet here. I love this stage in a painting. slide shows. Has anyone got the solution to that? Aaron Lifferth -- his work is great. Laura, Karen Bruson, and Gwen Bell. That's the only problem. that list grows every day. other paintings. Life is certainly fast and furious. 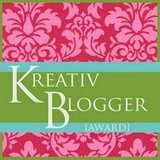 Labels: Kreativ Blogger award. commission. great day. Thanks for all of your support. Congratulations on all your recent adventures and successes. I'm honored to be listed among all your very accomplished friends (all of whom I am sure type better than I do, too). The painting is off to a fine start. Reading your posts I always feel like a troglodyte -- so if we're talking accomplished I think you are way up there. Yes the painting is going well, and I am very happy. Congratulations Barbara! Another award appropriately extended. Love the start of your new commission. It will be fun to check back in to see how you develop and finish it. Can you go back to the people who gave you the other awards and retrieve the awards from them? You are a dear and kind friend! Wishing you ever success. Oh, and your painting looks promissing! passionate artist, and it shows in everything you do. In my opinion, that's more than enough. that's a rare mark indeed. But you'd get it every time. my slide shows. Simple computer ignorance I suspect. Maybe some day you can help me with that. Never mind. Yes it's an exciting time. I just feel happy. So the computer issues will resolve. Meanwhile what a great painting you posted. Thank you, kind friend! And congratulations - you deserve it!